This entry was posted in Non-fiction and tagged Charles Dickens, John Harvey, Peter Lang publishers, The Poetics of Sight, Visual metaphor by Simon Lavery. Bookmark the permalink. This does really interesting, wide-ranging and very readable too, not at all dry. The sections on modernist writers and metaphor sounds especially fascinating – that’s a lovely quote on the POV in Woolf’s work. Is it the sort of book one could dip into every now and again or would it benefit from being read in sizeable chunks? Jacqui: it would be either – dip into those bits that appeal most, but is also rewarding to read straight through. It sounds absolutely fascinating, and a real find. The idea that literature in part changed to reflect developments in technology, painting to photography to film, feels true but I can see how much there could be to explore there. I’m not surprised my Bohane review prompted thoughts of this thesis, it sounds a clear example of what’s being discussed here. I’ll keep an eye out for this, thanks. Thanks to you, Barnaby, for taking the trouble to read it and post your comment. Dr Harvey’s work is always interesting; how lucky you were to be his student! 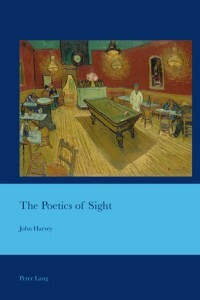 Barnaby: I should have added in my first reply – I also wrote a piece on John Harvey’s book on the colour black, and several (including a guest post by another former student of his, the late Dr Michael Flay) on his fascinating novel about Ruskin and Effie Gray, Study of a Portrait. If you’re interested, simply type the author’s name in the search box at the top of my home page and links should appear.